Matt Duke, foreground, performs "Colangelo's Lie" on WIP while the song's writer, Patrick Resch, looks on. 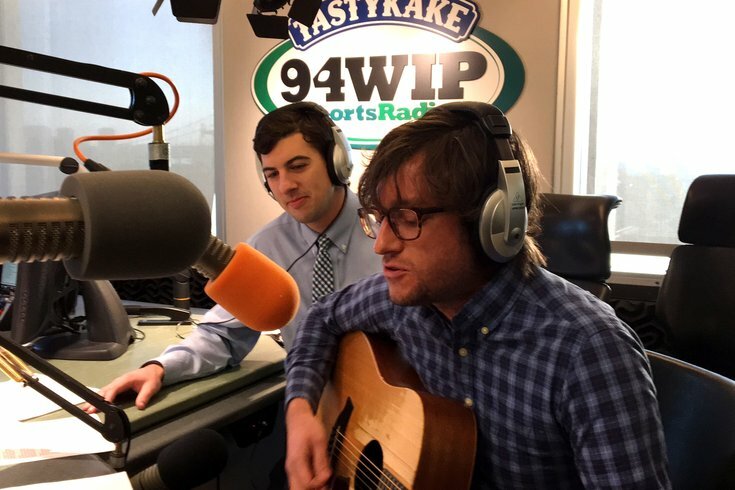 Late last week, I shot and posted a video of local singer/songwriter Matt Duke performing a Sixers-themed cover of Don MacLean's "American Pie," with the new lyrics written by Flourtown native Patrick Resch. To say that they knocked it out of the park with this song would be an understatement. On Monday, I joined both of them in studio with Angelo Cataldi and the rest of the SportsRadio 94 WIP Morning Show crew to talk a little Sixers, but mainly to play some of it live on air. After we wrapped up, original Process truster and WIP Program Director Spike Eskin took us into an adjoining studio to record the full song. Spike is also one of the hosts of The Rights to Ricky Sanchez podcast, along with Michael Levin, and despite the fact that I've previously failed to credit them for taking #TTP mainstream, he liked the track so much that there may even a live performance at their Draft Lottery Party at XFINITY Live! on May 16. And with a theme like "The Process is Dead," Pat's lyrics fit almost too perfectly. Last year, they had 2,500 people in attendance to watch the Sixers land the No. 1 pick. This year, they're expecting even more as they retire Sam Hinkie's jersey (suit jacket?) and officially declare The Process to be dead. You can get tickets, here, but don't waste time because they're free ... and going quickly. Anyway, special thanks to Spike for allowing us to record a much more professional sounding version of the song. Enjoy [and a reminder there's a NSFW word or two in here]. Did you read the book of flubs? If The Process tells you so? Do you believe in Williams, Mo? Can pick-swaps save your mortal soul? And can you teach me how to lose real slow? Could management unload a center from Duke? The day The Process died? The day The Process died.